The CIBIL Score plays in an important role in determination of your credit eligibility for a loan or credit card, as per RBI guide lines money lending institutions have to consider CIBIL ratings before rejecting and giving loans for credit cards, Each and every employee knows the importance of CIBIL score and its use. All the EMI links are based on CIBL score, Credit Information Report in simple form CIR summarizes your payment history of loans and credit cards, based on this credit history Credit Score is generated. The CIBIL Score is ranging from 300-900, your CIBL score is based on your pan card, if you have a bad CIBIL score follow the below process to improve your ratings. 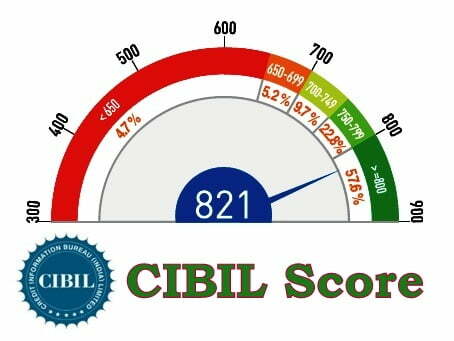 This CIBIL score plays an important role in loan approval process and credit card approval process, When you are applied to a loan the bankers do first thing as checking your CIBIL score, your lone is based on CIBIL score, if you are applied for a home loan and other credit loans. bankers check your CIBIL score to grant loans, if you’re CIBIL score is less than 700 they do not give home loan amount you needed, for example your CIBIL score is greater than 800, bankers will give loans amount you needed easily to you because they believe you. Increasing and decreasing of CIBL score depends on your pan card, you have to maintain at least more than 50000 transactions in pan card, all yours EMI and credits links are based on pan card. Clear the loans taken form the banks and credit cards payments speedily as much as possible, if you are doing this properly CIBL show positive ratings, in case of you are unable to clear the credit card payments and loans because of money problems, contact to your CIBIL ratings agency, you have to remember some important points, Late payment leads to piling up of interest and would require more money to clear dues, you have to pay EMI and bills speedily as much as possible before dew date. You need to maintain secured loans, and keep your unsecured loans ( personal loans ) under check, always try to maintain an 80-20% ratio between your secured and unsecured loans, 80% is the secured loan fraction, if you have number of unsecured loans is grater then secured loans bank will take this as minus point, so we have to avoid unsecured loans and maintain secured loans, The impact on your credit score is positive when you repay your secured loans on time. You are suggested to use 30% of credit limit and if you are used more than 50% it says that you may have issues in the repayment of the debt it will affect in CIBIL ratings, and it leads to decrease in CIBIL ratings, when CIBIL ratings are decreased it is difficult to grant a loan from the bank. If your ratings are excellent, banks will be offers you to increase your credit limit, it doesn’t mean you have to spend more money on it will give confidence of the bank in you, you haveright to ask your bank to increase your credit limit,So, the 30% utilization rule and getting enhanced credit limit is very important for a higher rating on the CIBIL scale. Avoid too many applications for requesting loans and enquires and credit cards in same time it will affect CIBIL ratings, to improve CIBIL score and ratings maintain minimum number of credit applications for loans and enquires and credit cards and avoid submitting this forms at a time. CIBIL score between 800 to 900 will give you immediate loan. This same condition will apply for 750 to 850, now 700 to 750 they will give a loan. If your mistakes are corrected, your CIBIL score will increase. If you are in the range of 650 to 700 it is their choice to give lone for you or not, below 650 they do not chance to get loans from banks, so we have to maintain minimum CIBIL ratings to get credits and loans from banks. Everyone who need to check their CIBIL they can follow the steps to check their score or ratings from the official website of CIBIL with paying user charges or processing fee of Rs.550/- from the following steps. Make a payment to RS.550/-. The credit report is emailed to you. The credit score is a numerical expression based on a level analysis of a person’s credit files, to represent the credit worth iness of an individual. A credit score is primarily based on credit report information typically sourced from credit bureaus, you can also check your CIBIL score for free by the following process. Open the given URL https://myscore.cibil.com/CreditView/enroll.page?enterprise=CIBIL&offer=FACR. CIBIL will show your Credit Information Report.